2 chairs 19 inch W x 19 inch D x 35 inch H. Seat Dimensions: 16 W x 17 D x 17 H.
Stacking chairs are ideal when you're short of storage space. 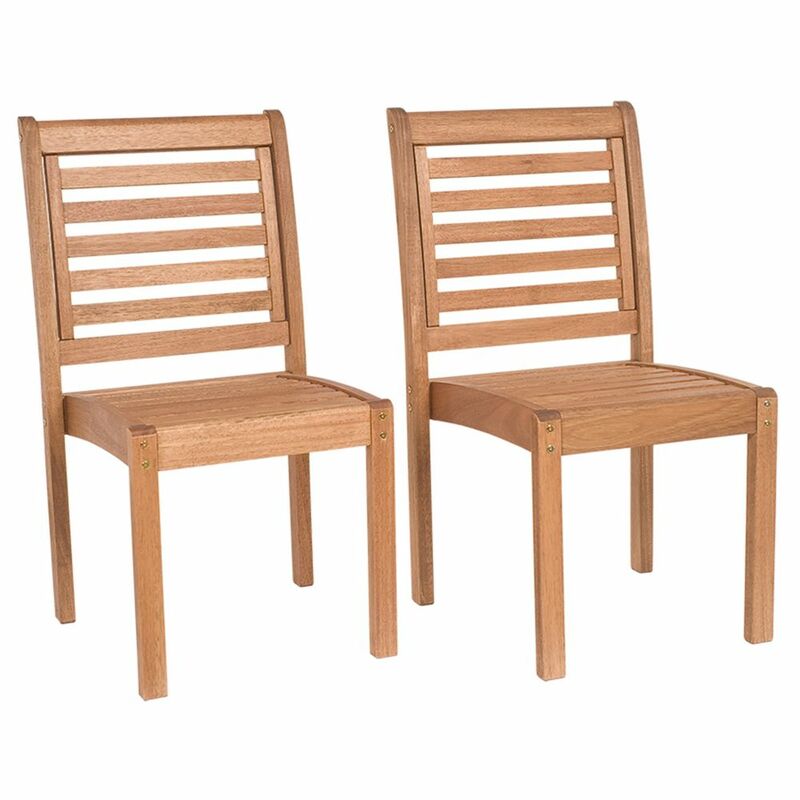 These Hampton Bay sling-style garden chairs are the perfect design for dining right height, right slope on the seats and back supports, and comfortable too. They have heavy-duty steel frames that are powder-coated for long life and good looks. The sling seats are made of strong, weather-proof PVC-coated polyester that's easy to keep clean and quick to dry after it rains. That means they're always ready when you want to have an impromptu meal on the patio. Indulge yourself and large gatherings in the ultimate outdoor dining experience with the Crestridge 7-Piece Sling Dining Set. Comfort and indulgent relaxation begins immediately once you have a seat in 1 of the padded sling motion chairs. The refined wood-pattern tile-top dining table is ideal for outdoor events with friends and family. Featuring a rich, chocolate brown powder-coated finish, the set announces its style to any outdoor seating area, while a rust-resistant steel frame and weather resistant sling fabric incorporate comfort and durability. The Bora arm chairs in anthracite are commercial outdoor dining chairs with arms. They are a fantastic edition to any restaurant, patio, indoor/outdoor community pool, or back yard setting. The stylish Italian made chairs are stackable with replaceable non-slip feet. They will not fade, peel or rust. They are designed to last for years and withstand constant use. They are ergonomically designed for maximum comfort. The Bora arm chairs in red are commercial outdoor dining chairs with arms. They are a fantastic edition to any restaurant, patio, indoor/outdoor community pool, or back yard setting. The stylish Italian made chairs are stackable with replaceable non-slip feet. They will not fade, peel or rust. They are designed to last for years and withstand constant use. They are ergonomically designed for maximum comfort. Eucalyptus Stackable Patio Chair Set without Arms The Amazonia Collection is committed to providing premium quality sets with an elegant design that will make your home stand out above the rest. Crafted from solid Eucalyptus Grandis wood, grown in 100% managed forests in Brazil and certified by the FSC (Forest Stewardship Council), this eucalyptus furniture is known for its longevity and craftsmanship at an affordable price. Enjoy your patio in style with these great sets from our Amazonia Collection. Eucalyptus Stackable Patio Chair Set without Arms is rated 5.0 out of 5 by 1. Rated 5 out of 5 by GardenGranny from Sturdy, well-made chairs. Sturdy, well-made chairs.